This recipe is from Chloe Coscarelli’s new cookbook “Chloe’s Vegan Italian Kitchen”. 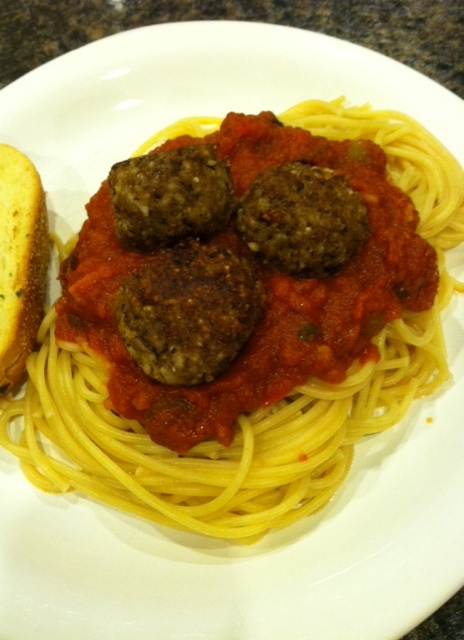 The recipe is actually called “Mama’s Spaghetti and Meatballs”, but I only made the meatball part. I just used a jar of spaghetti sauce as a shortcut. These “meatballs” are so dang good! And they aren’t that hard to make! I ran out of brown rice and had to add some white. My grocery store was out of cremini mushrooms, so I used baby bella instead. I think this meatball recipe is similar to the slider recipe I made a little while ago. Really really good, really easy, and vegan! Heat olive oil in a large nonstick skillet over medium-high heat, and cook onion and mushrooms until soft and lightly browned. Add garlic and cook a few more minutes. Transfer to a food processor. Reserve the skillet for later use. Add cooled brown rice, bread crumbs, flour, basil, salt, pepper, and red pepper, if using, to the food processor. Pulse until the mixture just comes together. If necessary, transfer the mixture to a large bowl and mix with your hands. Season to taste and let cool slightly Form the mixture into 1-to-2-inch balls. Heat canola oil in the reserved nonstick skillet over medium-high heat, and panfry meatballs in batches, adding more oil as needed. Rotate the meatballs with a wooden spoon so they are very well done. They should be browned on all sides with a nice crust. Remove meatballs from the pan using a slotted spoon and drain on paper towels. This entry was posted in appetizer, main, side dish, vegan and tagged Chloe Coscarelli, Chloe's Vegan Italian Kitchen, cremini, meatball, mushroom, rice, spaghetti, vegan, vegetarian. Bookmark the permalink.